Your mother is a special woman. She has been there for you no matter what. So, what do you get the woman who has endured sleepless nights, early mornings, and countless hours of stress while still loving you unconditionally? If you are having trouble finding an answer, we put together the perfect list of creative gift ideas for Mom that will help say thanks and show your love and appreciation. Reference our homemade and diy gift ideas for Mom to provide even more creative inspiration. 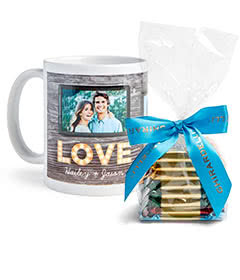 With customizable photo bracelets and bangles, Mom will always be able to show off her favorite photos. This Silver Claudia Bangle works for birthdays, holidays, or for just saying thanks. Find a nostalgic wedding photo from mom’s old album or a baby photo that will make her smile each time she looks at it. These durable bags can serve as environmentally friendly grocery bags, beach bags, work bags, or bags for the gym. For the mom who is always on the go, these canvas totes are fun gift ideas. With the option to personalize the message on the tote, Mom will never lose track of her personal items. Find that perfect photo of you and Mom and add it to a classic wooden frame. For a little something extra that will make this gift stand out, personalize it with an endearing quote like this: Mother’s Love Wood Frame. A personalized cutting board is the perfect addition to Mom’s cooking arsenal. Looking for one that will last forever? The Stately Name Cutting Board features an engraved message that can be passed down through the generations. Attach your family name to the board and make it something truly special. Take Mom to the ball game, out to the park, or sit cozy by the fire with some s’mores and a fleece blanket. These fleece photo blankets let you add your favorite family photo so that Mom will always be close to her loved ones. Choose a photo from your favorite trip or party where the good times can be relived over and over. Pillows add comfort, color, and personality to any room. This Destinations Pillow is a great fit for a Mom who can’t get enough of the lights from the big city or just loves a family photo from that trip to the Grand Canyon. When company comes over, you want to make sure Mom is prepared with the finest tools for entertaining. From wine to water, the decanter is a mainstay at holiday gatherings or at a wine and cheese party with the neighbors. 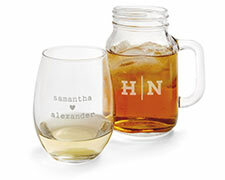 This personalized decanter lets you add a favorite family saying or quote while you enjoy a glass of wine. A scented candle makes a wonderful addition to any room in the house. Create a touching photo candle with a picture of the family or maybe the one Mom loves from your grade school graduation. Remind her that you are, and will always be, her shining light. Upgrade Mom’s dinner set up with glass plates and show her that, after all these years, you finally appreciate how important it is to spend time with family around the dinner table. These stained glass patterned glass plates are built to make lasting impressions and keep conversation going even after dessert is all gone. There is no better way to capture memories from family trips, graduations, holidays, or birthday parties than the classic photo book. Leave it out on the coffee table or pass it around the dinner table to reminisce about old times.